You don’t get your time back. Ever. But once you make the time, what then? 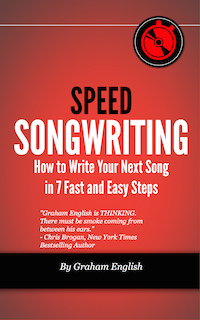 In this songwriting cheat sheet, I recommend starting with a title. But what if you’re just not in the mood to write? How do you overcome procrastination and write more songs? You’ve heard the legends about famous songwriters who find hit songs lying around in their couch cushions. Not only are the legends probably exaggerated, they describe 1 out of 100 songs, if that. You’ll usually find your creative peak after you’ve warmed up. Step 1: Warm up the body. Increasing your blood flow helps you think. Step 2: Warm up your instrument and voice. You don’t need get your chops up to top speed. You just need to remove any cobwebs that could bum out your session. Step 3: Warm up your writing. Grab a random word or phrase, put it into Google Images, and describe what you see. Extra Credit: Use the Lyric Triad as a writing prompt. That’s it. Get your blood and brain moving for a few minutes before you dig in. Make an appointment today. A “songwriting spa” appointment. Put it in your calendar. It will last only one hour. Any tips for a guy struggling to find the motivation to work out daily, and just practice better fitness on the whole? TREAT THE GYM LIKE A SPA. Yes. It has to feel good. I tell people this a lot – go to the gym, and just sit there, and read a magazine, and then go home. And do this every day. Go to the gym, don’t even work out. Just GO. Because the habit of going to the gym is more important than the work out. Because it doesn’t matter what you do. You can have fun – but as long as you’re having fun, you continue to do it. But what happens is you get a trainer, your whole body is sore, you can’t feel your legs, and you’re not coming back the next day – you might not come back for a year! I worked my way up to 2 hours a day. I ENJOY my workouts. They are my peace, my joy – I get my whole head together! I value that time more than my shower! And it really gets me together. But it’s a habit. There are times when – I’m not even kidding – there are times when I”m in the middle of a work out, and actually woke up because i am so engrained with going to the gym and being there – it’s that much of a habit to me. The first thing I do in the morning is work out – I lay out my workout clothes the night before, and just hop in ’em. So lay out your clothes, and go to the gym, and relax. But sooner or later, you WILL work out. The habit is more valuable than the writing. Sooner or later, you WILL write a song! Doesn’t matter what you start measuring. Don’t feel like you have to measure everything. Just pick one thing and stick with it for a while. Think of it as a measuring sprint instead of a marathon, if that helps. You’ll get a baseline and then you can stop measuring and just check in every once in awhile. Then, you can measure something new. For the next 14 days, measure your songwriting output so you know exactly how many songs you’re writing and how long it takes. Once you know, I guarantee you’ll want to improve it. By measuring, you just made it a game! As you improve your numbers, you gain confidence, motivation, and the momentum it takes to keep going. Because your time is important. Once it’s gone, you don’t get it back. You’re already writing at a speed. 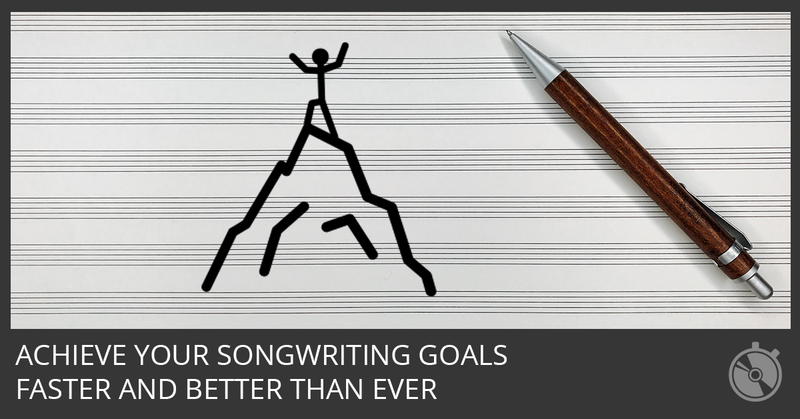 You’re a valuable, limited-edition songwriter. That means a lot, Jeff. Thank you! …thank you for the tips…helps shake off the fog.. The blood flow thing explains why it’s always easiest for me to write at work. Thanks Graham, I’m actually recording my first cd, ever. And I’m noticing as I’m driving home from the sessions, I’m half way into a new song. It does work, the warm ups. Thanks for being honest with us. Very Good Grahm! Thanks for still sending me your emails! Thank you Graham, I seriously needed this! Discover the 6 basic chorus forms, 5 types of chord progressions, and MUCH MORE!